​Causes of tropical cyclone hazards, including ocean temperature, atmospheric pressure, wind shear and Coriolis force. 1. What is the minimum ocean surface temperature that is required for a tropical cyclone to form? Draw a diagram to explain your answer. ​Study the graph on the right carefully. 2. 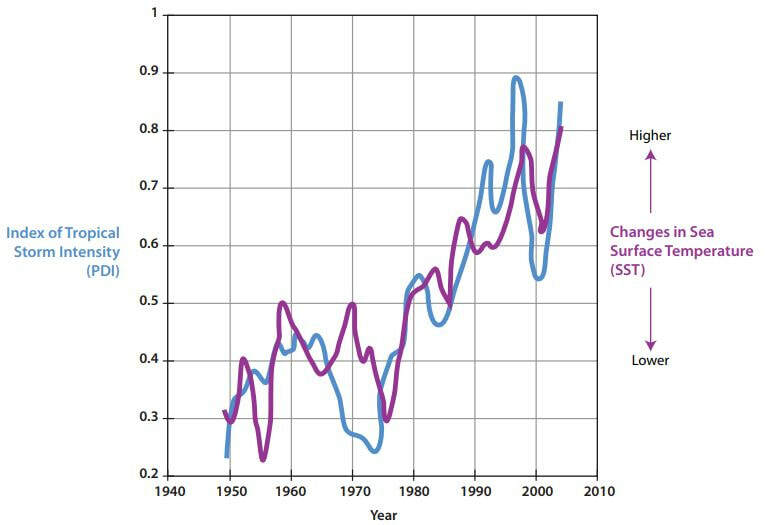 What correlation does it appear to show between ocean surface temperatures and the intensity of tropical cyclones? Use data to support your answer. 3. 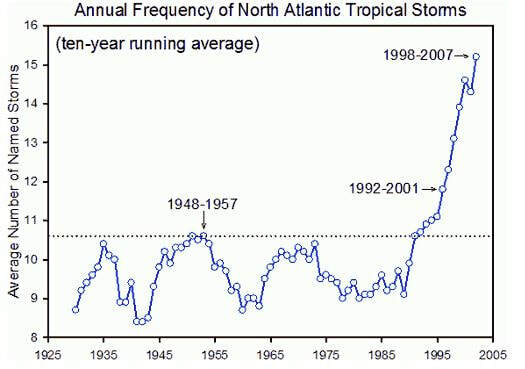 Based on your knowledge of the formation of tropical storms, what is the reason for this correlation? 4. Based on what you can see from this data, why do you think that climate scientists predict that climate change is likely to lead to an increase in the frequency and intensity of tropical cyclones? Draw a diagram to explain what is meant by vertical wind shear. Why are tropical cyclones more likely to form and develop in areas with little wind shear? Why is the coriolis effect zero at the equator? 1) Draw a diagram to explain fully how the coriolis force works! 2) Why is the coriolis effect crucial to the formation of the spiraling bands of wind in a tropical cyclone? 3) How does the coriolis effect help us to explain the distribution of tropical storms? 4. Investigation: are tropical storms increasing as the earth gets warmer? How is global temperature changing? Is the number of tropical cyclones changing? How? Is the intensity of tropical cyclones increasing? How? What do climate scientists have to say?